You know from my previous posts since August, that my son is playing football. Add to that the fact that he's THIRTEEN and sometimes you have one stinky boy! That's why when I was contacted to do a review of the new Febreze SPORT, I thought "Thank God! A product I can spray in his shoes, in his football equipment bag, and more - without him complaining that it "smells like a girl!" The Febreze SPORT Extreme Odor Eliminator is the leading home freshening brand’s first product that has been designed primarily for athletes. 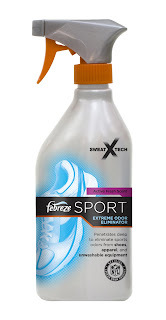 Febreze SPORT Extreme Odor Eliminator is a trigger spray that instantly neutralizes the toughest sports odors on shoes, sports gear, and apparel – including those un-washable shoes, equipment and gym bags! Whether you’re a marathon runner, an avid gym-goer or a mom who is trying to keep her kids (and their sports gear) fresh, we would like to send you a branded gym bag and complementary sample of Febreze SPORT. We were sent the Active Fresh spray along with a gymbag. As a longtime Febreze fan, I love the scent of this product! As soon as I got it, I started spraying stuff down! My son's cleats, his equipment bag, his practice outfit, heck, I even sprayed some on the carpet, just to test it out. Febreze SPORT left a clean, fresh scent and everything smelled MUCH better than before! As soon as I find the laundry boost, I'll be buying it! Disclaimer: MS&L Worldwide sent me this product to review. Receiving a product for free will NEVER influence the opinions I share on my blog or in real life. My opinions are my opinions, and yours may differ. Great review! Looks like something I would certainly use!